Josiah Hughes Bell, the founder of East and West Columbia, Texas, was one of Stephen F. Austin’s original colonists and Austin’s trusted friend. Austin left Bell in charge of the colony when he had to go to Mexico City in 1822 to confirm his empresario grant with the new Mexican government. Thus Napoleon and his men meet with Bell, rather than Austin, when they arrive at the Brazos River in Napoleon in America. At the time, Bell was finding it hard to keep the colonists’ spirits up. Josiah Hughes Bell was born on August 22, 1791, in Chester District, South Carolina, the son of John and Elizabeth (Hughes) Bell. John died when Josiah was five years old. At the age of 11, Josiah Hughes Bell was sent to Nashville, Tennessee, to apprentice with two uncles who were hatters. Ten years later, he moved to the Missouri Territory and began his own hat manufacturing business. During the War of 1812, Bell fought against the Indian attacks instigated by the British. In 1818, Bell sold his business and went to visit his mother, who was living in Kentucky. While there he met and married Mary Eveline McKenzie. They settled in Natchitoches, Louisiana, where Bell developed a prosperous business. Unfortunately, his business partner disappeared with all of the profits. 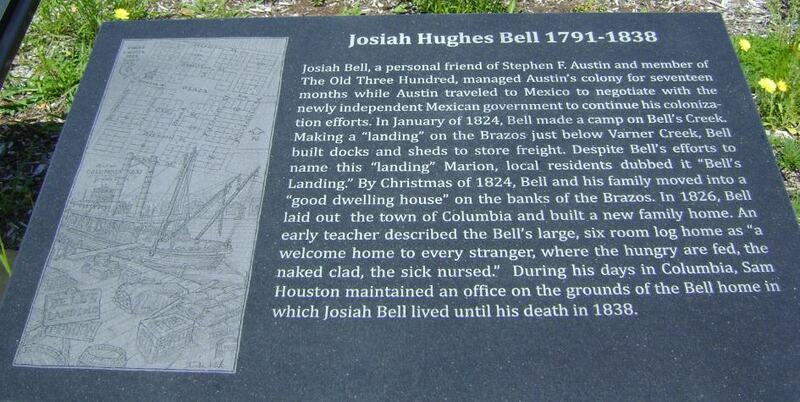 Josiah Hughes Bell moved to Texas, which was then part of Mexico, and joined a Missouri friend, Stephen Austin. Austin’s father Moses had received permission from the Spanish government to settle three hundred Anglo-American families in Texas, but died before completing the task. Stephen Austin took over his father’s job. On October 6, 1821, at Nacogdoches, Stephen Austin granted Josiah Hughes Bell permission to settle along the Brazos River. As Mexico had recently declared its independence, Austin was obliged to travel to Mexico City to seek the new government’s authority to give the settlers title to their land. Since Bell was one of his most trusted friends, Austin left him in charge of the small number of families who had already arrived, as well as the incoming colonists. In March 1824, Austin appointed Josiah Hughes Bell as lieutenant of the militia within the Brazos district. Bell’s land grants were located on the west side of the lower Brazos. He built his home there and developed a sugar plantation. A town called Marion, or Bell’s Landing (now known as East Columbia), grew up around a river landing he constructed. It became the most important shipping point in the colony. In 1826, Bell laid out the town of Columbia (now called West Columbia), two miles west of Marion. Josiah Hughes Bell became a prosperous colonist. He built a hotel in Columbia to accommodate the many travellers who came to visit him. He also constructed a school. Bell was loyal to the Texas cause during the Texas Revolution. Columbia served as the capital of the Republic of Texas from September to December 1836. Josiah Hughes Bell died in Columbia on May 17, 1838, at the age of 46. He and Mary had eight children: Samuel (1819), Elizabeth Lucinda (1820), Thaddeus (1822), James Hall (1825), William (1828), John (1832), May (1834), and Amanda (1836). Mary Bell died in 1856, after being thrown from a carriage. Eugene C. Barker, ed., Annual Report of the American Historical Association for the Year 1919: Vol. II: The Austin Papers, Part 1 (Washington, 1924), p. 415. Oh, the things you stumble across on the internet! I’m sitting in present day Chester county South Carolina and I believe while researching my family I stumbled across the Bell family in some form or another. I never had any inkling that there was that much of a connection. Many from here made their way to Texas by way of Missouri or Arkansas. Makes perfect sense once there is some context. Thanks, Curt. It’s lovely to hear from someone in Bell’s home county. Glad you stumbled across the post! I am a direct descendant of Josiah Hughes Bell and have written a book primarily about he and his son, James Hall Bell, the first native Texan elected as a justice in the Texas Supreme Court. The book is First in Texas. I would like to know about your interest in Bell. He is my great, great, great grandfather and I was recently involved with having a Texas historical plaque erected for him at the cemetery in West Columbia where he is buried. Lovely to hear from you, Bob. Josiah Hughes Bell is a character in my novel, Napoleon in America. Hello Bob. Josiah and Mary are my g g g grandparents as well. I have been fascinated by them for years. Flora Bell was my grandmother. I would love to talk to you and learn anything about their tie in Kentucky. I have located Josiah’s grandfather’s grave and plan to go there next summer. He is our immigrant ancestor. How nice to hear from another Bell descendant, Rebecca. I’ll put you in touch with Bob so you two can communicate directly. I am also related to Josiah H Bell. He is my ggggg grandfather as well. I believe his daughter married into the Marken family. We are actually featured in the Alvin, Texas museum. My Grandfather Glenn Charles Marken researched a lot of our family history and a lot about the Bell family. I always wondered how many people are related to me by Josiah H Bell. I too happened to stumble across this article. It’s great to hear from you, Lauren. This is wonderful. I have so many things from my family. I am Katharine, 5th in line. My great grandmother Katherine C. Bell (NiNi) as I called her was one of the founders of Children’s Hospital Kings Daughters here in Norfolk Virginia. I actually have a coin on it that has been passed down among other things. Granny who passed away a few years ago spoke of her grandfather Thad Bell who was the Vice-president of New York Life Insurance. I have a 3 ft tall sterling silver golf trophy with his name on it. Would love to find out what this group of the rare Coin that says 1819 and the small hammer saw and I assume a key? Granny kept these with a few other of Nini’s Things from her father Thaddeus Copes Bell. By the way my son is also Thaddeus…kinda fun. If anyone knows why this was something he valued with Austin and around that time, I would love to know the history. Thanks, Katharine. I hope one of the Bell descendants reading this post can provide some insight into these objects for you. I rely greatly on your prudence and judgment in preserving harmony and content amongst the settlers.